Starbeast Slayer Fantasy Display Sword with Wooden Wall Mounted Plaque Display - Extraterrestrial Alien Glyph Blade Inscription - Detailed Hilt, 2-Headed Monster, Skull - Large 39" | BUDK.com - Knives & Swords At The Lowest Prices! 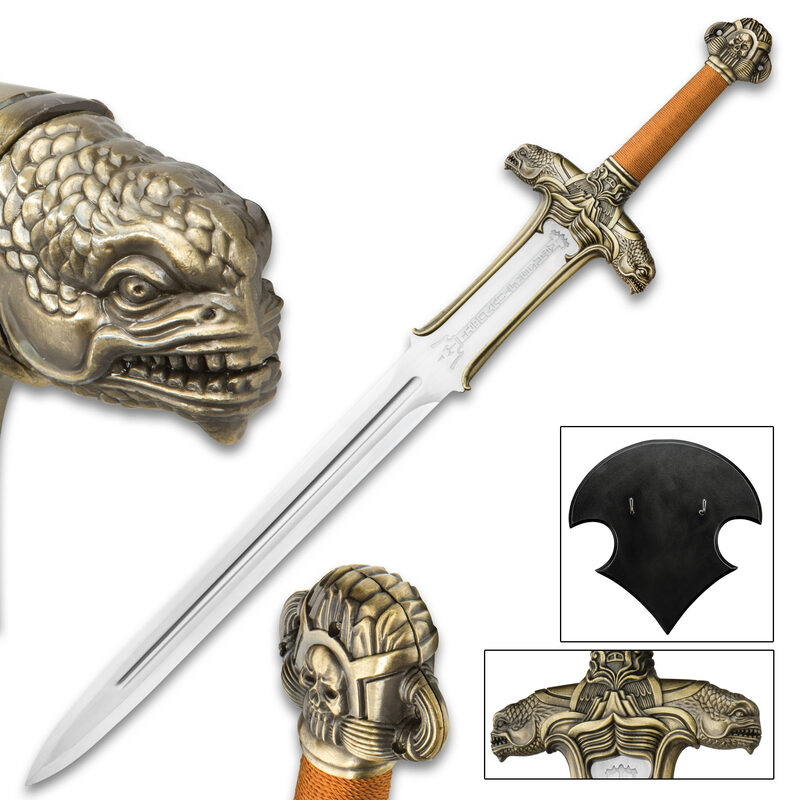 Starbeast Slayer Fantasy Display Sword with Wooden Wall Mounted Plaque Display - Extraterrestrial Alien Glyph Blade Inscription - Detailed Hilt, 2-Headed Monster, Skull - Large 39"
Includes elegant wooden wall-mounted display plaque for showing off sword in style; enhances any space in home, office and elsewhere! 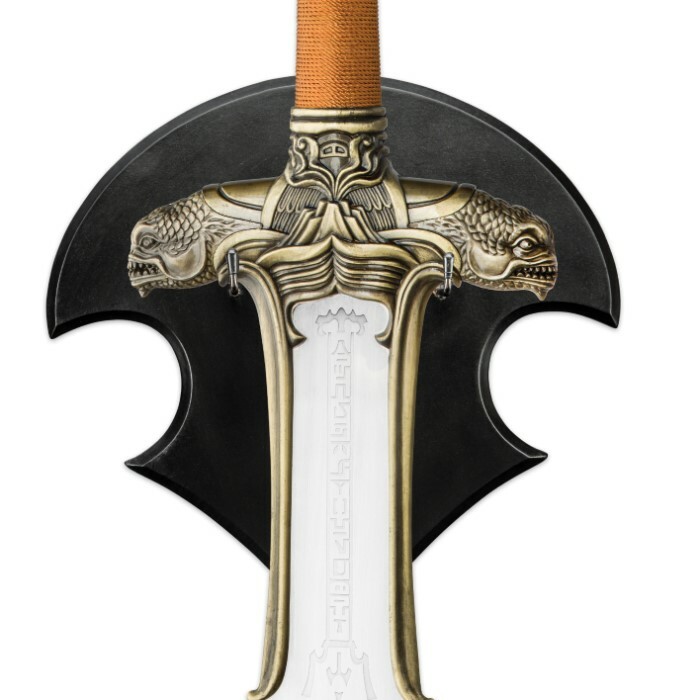 The Starbeast Slayer Fantasy Sword is big, bold and breathtaking, boasting a distinctive design, extraordinary fine details, visual charisma and colossal size that demand attention. The imposing display blade is flawlessly crafted from 420 stainless steel, carefully polished to a mirror shine and accented with a prominent fuller, as well as unique inscriptions that evoke extraterrestrial glyphs. 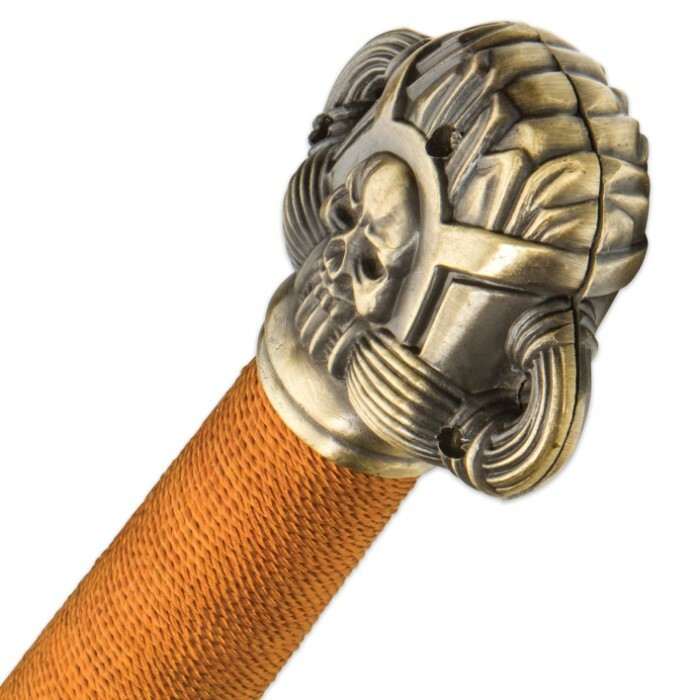 Intricately cast and bathed in a regal bronze-colored finish, the metal hilt is nothing short of spectacular. 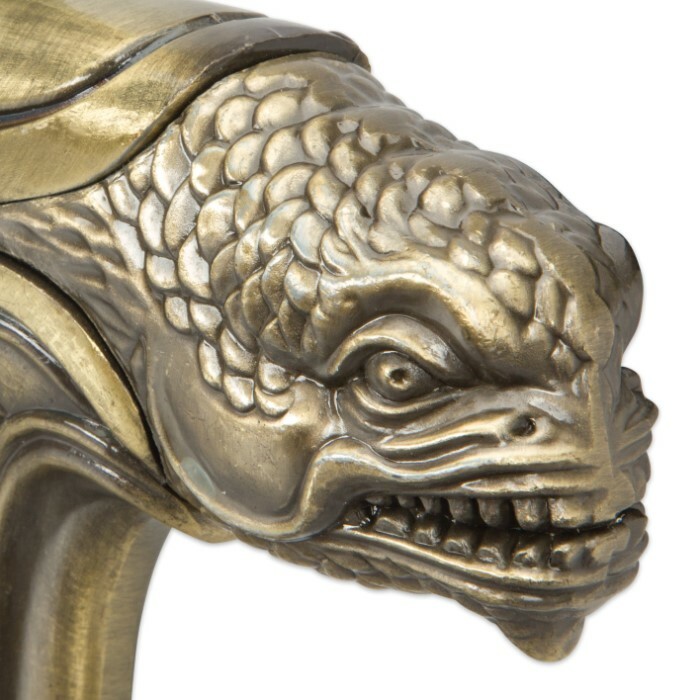 Two reptilian monster heads - both belonging to the namesake “Starbeast” - comprise the guard, and the pommel is fashioned into a unique skull motif. Meet the "starbeast": the "Scourge of Seraphim" and the "Child of Cherubim"
On a small planet in the spiral galaxy we know as Messer 77, a small earth-like planet called Seraphim orbits Cherubim, a rare quark star. The little-understood star type's otherworldly heat, violent forces and pressure exceed those of our own sun by trillions of orders of magnitude, causing Cherubim to generate exotic quantum particles and exude strange energies. Some of these mystical energies develop consciousness, sometimes even physical form and, rarely, an eternal soul. So was the origin of the "Scourge of Seraphim," a terrible yet awe-inspiring starbeast with two reptilian heads and horrible power that well exceeds human understanding. Who shall slay the starbeast? Is any man of Seraphim worthy? Adam was formed from the mere dust of the Earth; but the "Scourge" is made of - nay is - the very forces of the universe itself. As such, time and space are at his mercy, and even the very laws of physics don't count him a subject. The Scourge isn't the only god-like entity created by Cherubim, but he is without question the most evil. But the good, just protector gods - born in Cherubim's infancy - have all evolved beyond the universal realm, leaving only the humble, human-like citizens of Seraphim to keep the Scourge at bay. 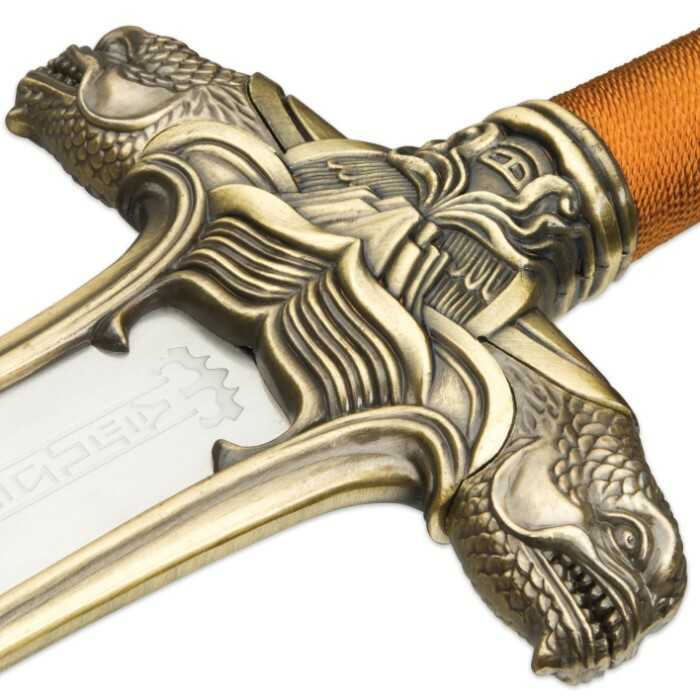 One god, Chelub, took pity on the men his high order of deities had abandoned and told the inhabitants of Seraphim if he could find a worthy soul, he'd impart a powerful sword that he prophesied to be the Scourge's bane. Of all the legendary Seraphim warriors, there was but one considered worthy: Absalom, a mercenary born of low blood. The humble man took up the sword and slayed the starbeast, no longer feared as the "Scourge of Seraphim." The galactic road leads to earth - are you the next worthy bearer? 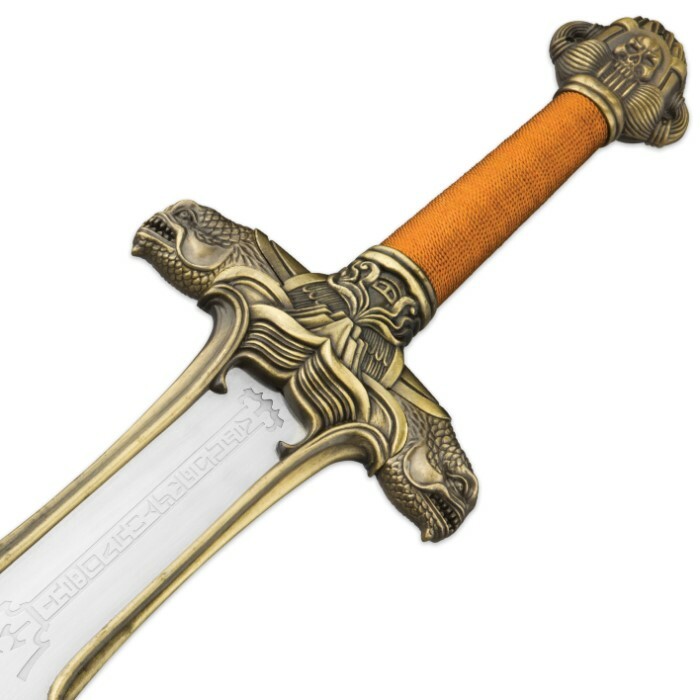 The Starbeast Slayer sword shattered into billions of pieces and drifted for hundreds of millions of years through many galaxies, wormholes and nebula, before reforming on the edge of a galaxy called the Milky Way, as if through divine intervention. It fell to the earth, unscathed by heat of atmospheric friction, and there it rests today - hidden - until one worthy soul claims it for the intergalactic battle whispered to come - within our lifetimes. Are you the worthy soul?